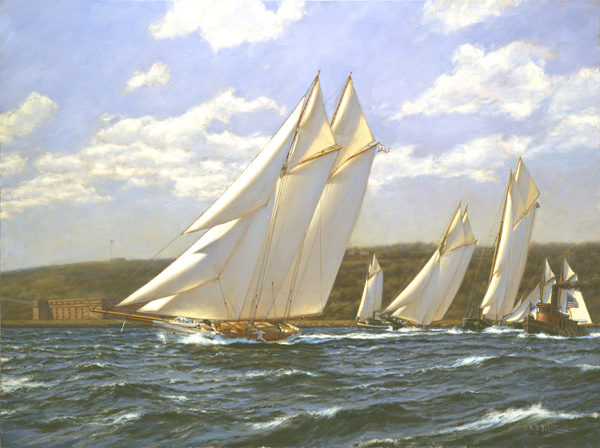 Magic" is shown beating through "The Narrows", off Staten Island, closely followed by (left to right) "Sylvie", "America", "Cambria"( the challenger from England) and "Madeline". Accompanying the yachts are two tugs chartered by the New York Yacht Club for the day.The yachts had to start from anchor and, as can be seen, both "Sylvie" and "Madeline" are still in the process of hoisting their fore-topsails. In the left hand background is Fort Wadsworth, with the hillside bare of trees, in comparison to the heavily bushed area behind the yachts. After the start the light breeze freshened and "Magic" is now heeling over 'near lee rail'. This was the first time the America's Cup had been raced for in the United States, since "America's" win in 1851. 17 schooners ( 16 American) started in the race for the cup. In future America's Cup events only one defender raced the challenger, with a series of races to decide the winner, unlike the single race of 1870. "Magic" was first yacht to finish and also won the America's Cup on corrected time. "America" finished 4th and 4th on corrected time, "Sylvie" finished 7th and 3rd on corrected time, "Cambria" finished 8th and 10th on corrected time and "Madeline" finished 12th and 13th on corrected time. The "America" raced with a US Navy crew and had been refurbished by the Navy for the race. "Madeline" was chosen and successfully defended the America's Cup in 1876 against the Canadian challenger "Countess of Dufferin". "Magic", a centreboard schooner owned by Franklin Osgood, was one of the smallest yachts in the America's Cup of 1870, measuring 84 ft. on deck. She was launched in 1857. "Cambria", owned by James Ashbury, measured 108 ft. on deck and was launched in 1868.